ARRL Field Day Packet - Get Ready! If you want to add to your CW DXCC totals, there's no better contest for little pistol North American stations than the ARRL DX CW contest. Why? 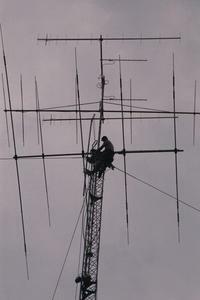 Unlike the everybody-works-everybody contests, DX stations must work W and VE stations - that's you! No bulletins in this issue. I forgot that the original provocateur for the "how many dits in a row" puzzle was actually Barry W6YE! Runner-up provocateur, Jerry VE6CNJ, is still on the job, however, sending in this short slip of an all-dot sentence: HIS SIS SEES 5 SISSIES. Just in time to practice for those EE5 stations in this weekend's ARRL DX CW contest. The 2010 ARRL Field Day packet of rules and forms is now available and you can download it as a PDF package. Field Day (June 26-27, always the fourth full weekend in June) is a prime opportunity for recruiting new folks to ham radio and for educating new hams about HF contesting and operating. If your club hasn't selected a site yet, consider locating yourself in a publicly-accessible area and encourage visitors - you can add lots of points from public-exposure bonuses and from your GOTA (Get On The Air) station. The Milwaukee-area and New Jersey are both host to an FM Simplex contest this coming Sunday especially for Technician licensees and hams that haven't tried contest operation. 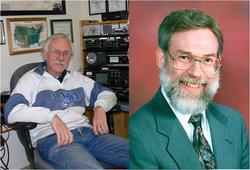 The original contest was conceived of and run by the Milwaukee Radio Amateurs Club. Hoping to spread the fun to other areas, the New Providence ARC is hosting an event as well. Encourage your local VHF FMers to give it a try! Or have your club plan and host one! Bob N6TV writes with a demo of a new Win-Test feature. "Version 4.4 includes an "Audio Recorder" that lets you save an entire contest experience as an MP3 file. A separate free program called wtQsoPlayer enables you to convert your long Win-Test MP3 recordings into short "on demand" audio clips that anyone can access on the Web. All you need is the Web hosting space and basic text editing and file transfer skills. All of instructions and sample PHP scripts are included on the Win-Test Web site." If you worked Bob in the recent NA CW Sprint, you can hear your QSO recorded with Win-Test. "After you enter your callsign and press [ Search ], some "Listen" links will appear at the bottom. If clicking on the link doesn't play the entire MP3 file properly, right click on the link, select "Save Link As" or "Save Target As", and note where your browser has saved the MP3 file. Then double click on the downloaded file to play the QSO directly from your hard disk. The clips are +/- 30 seconds from the time I pressed [ Enter ] to log the QSO, so you may need to listen for at least 30 seconds before you'll hear yourself in the audio clip." These new tags are optional for all contests, but it recommended that logging software authors implement them in the Cabrillo format output utilities so that the program user address is read correctly by the contest sponsors. There is more information on these new tags on the CQ WPX Blog of Contest Director, Randy K5ZD. Some of the North Carolina counties are fairly remote, nevertheless the North Carolina QSO Party sponsors have been beating the bushes to activate as many as possible. Check out the list to see if any counties on your "Needed" list will be on the air! The increasing availability of remotely-controllable stations may lead to a careless operator violating local licensing restrictions. For example, you have to hold a valid license in the location from which you are transmitting and follow all local rules and regulations. Don't assume that you can operate from anywhere and just sign your call sign "portable wherever"! For example, CEPT license authority is only granted to "temporary visitors" and it's not at all clear that someone connecting to a station via the Internet is considered to be a visitor. Make sure you know the rules before transmitting! Steampunk, in case you hadn't encountered it before, is a combination of science fiction, fantasy, and antique technology. Aficionados of "steam radio" (a.k.a. vacuum tubes) are natural steampunks! The upcoming Nova Albion steampunk convention in California on March 12-14 incorporates elements of Maker Faire (see the next story) and other do-it-yourself activities. Maker Faires are going to be held in three US cities this year - San Mateo, CA (May 22-23), Detroit (July 31-Aug 1), and New York City (Sep 25-26). There is also an upcoming Maker Faire in Newcastle, England on Mar 13-14. The Maker Faire theme this year is the Young Makers, just like many of us when we were getting our start in ham radio. If you are part of a Detroit or NYC area radio club that might like to exhibit, ham radio has been a very popular attraction at past Faires. Contact the organizers via the Maker Faire Web site. (The San Mateo event has ham radio representation lined up!) Imagine thousands of proto-hamsters ready to learn about Amateur Radio! From the Jan 20 ARRL E-Letter, the IARU Administrative Council noted that all three regions have now reached consensus on three global Center of Activity (CoA) frequencies for use in the event of emergencies: 14.300, 18.160 and 21.360 MHz. When no emergency operations are being conducted, these frequencies are open for normal amateur usage. However, GAREC-09 calls upon IARU member-societies, among others, "whenever emergency communications are being conducted on frequencies that propagate internationally, to use any available real-time communications channels, including but not limited to e-mail bulletins, Web sites, social networking and DX-clusters to draw the attention of the largest possible number of Amateur Radio operators to on-going emergency communications, in order to avoid interference with emergency traffic." Ken KØPP discovered that the amateur radio articles that appeared in the January 2010 Linux Journal are now available on-line. 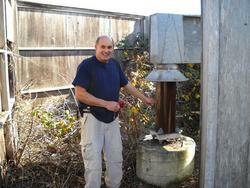 You can reach them via the Linux Journal "Virtual Ham Shack: or in this online article. Ghost code - The random letters and characters that your brain generates from the noise and sounds your ears hear with the headphones off after spending a few hours in a big CW contest. The post-contest shower can be particularly interesting! Speaking of cosmic zooms, NASA's Earth Observatory page has a nice writeup and video of a coronal mass ejection (CME) that occurred in late January as the Sun was coming back to life. Management and sponsorship of the Frequency Measuring Tests have migrated to a team of amateur time and frequency metrologists led by Connie K5CM, Tom N8ZM and others. A writeup of the latest results is online and boasts of some pretty impressive measurement capability out there! The next FMT will be held on April 22 (that's the UTC date - April 21st in North America) and will be announced in QST. This issue's tip is a lengthy one - a checklist, actually, by Jack WAØRJY, written for little pistols and medium guns in major contests such as this weekend's ARRL DX CW. Food for thought in the contest seasons to come. - Stay at the rig! QRZ.com reports that Lionel VE7BQH has just published his latest 2 meter Yagi performance table -- an important reference for serious VHF DX'ers. It provides key facts to help operators choose the right antenna for them. Rovers have to pack a lot of antennas to cover all the bands above 50 MHz! Tim KE3HT confronted the tradeoffs between performance and coverage and mechanical complexity with a log periodic. In this eham article he discusses his choice and how it affects his roving operation. The February 2010 issue of Analog Dialogue has an excellent article on PIN diodes by John Ardizzoni and circuits for controlling them with an op-amp. The article includes background on PIN diodes and how they work as RF switches. There are links to additional application notes at the end of the article. The January 2010 issue of High-Frequency Electronics has a couple of nice articles of interest to high-performance hams: "Make Sub-1dB Noise Figure Measurements - Part 1: Noise Concepts" and "Magnetic Materials in Transmission Line Transformers". The latter "Design Notes" column is dedicated to recent Silent Key, Jerry Sevick W2FMI by publisher Gary K9AY. Bill W5WVO contributes the URL for a Web page that covers the history and characteristics of most of the RF connector series in use today -- in simple language and photos. Good reference stuff! Jeff K8ND implemented a system of three on-site CW Skimmers at PJ2T for the CQWW 160 CW contest and has provided a description of the system. Each of the three SDR-IQ receiver used a different directive receiving antenna switched periodically depending on the target areas of interest. The outputs of the CW Skimmers were run through K1TTT's WinTelnetX software to combine them with spots from the spotting networks and provide them directly to the Writelog contest logger's spot window. An interesting question about antenna construction came in regarding methods to drill sets of holes at right angles to each other along a tube or other round material. After looking around on the 'net and getting nowhere fast, the way I decided that I would go about it is to use a drill press and clamp the tubing to a piece angle iron. Drill one complete line of holes with one face of the angle iron clamped to the press' working surface. Keeping the tube clamped to the angle iron, rotate the angle iron so that its other face is flat against the press' working surface. Drill the remaining holes. If the faces of the angle iron make a right angle, your holes will also be at right angles. This doesn't guarantee your holes are precisely separated by ninety degrees around the pipe's circumference, however. 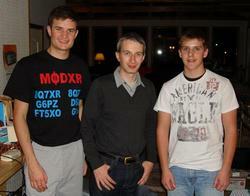 Although they've never met in person, Marv N5AW (left) and Team Leader Terry N4TZ form one of two WRTC-2010 Teams for North American Region #2. Only in radiosport could such a virtual relationship work out so well! A bit of hang time in the dentist's office yielded this gem from Woodcraft magazine for Feb/Mar 2010. The "Tips & Tricks" column suggests using the eraser end of a wooden pencil to hold and push small work pieces through a band saw. A slip with that technique only means you have two pencils, not one less fingertip. "The elegance of ferrite beads as a circuit design and problem-solving component"
We don't all necessarily need to become design engineers, but having the background information on why certain techniques work better than others and in what applications can be invaluable. An anonymous contributor sent in this week's Conversation piece. Perhaps you've seen the palindromic video that delivers two very different messages read in different directions. The same is true for the following text - which way of reading it do you prefer?